On my last day in Tokyo, I went into an art supply store that happened to carry the Kuru Toga pencil, an ingenious design that rotates the pencil lead as you draw, maintaining a consistent point throughout. I first learned of it through a Lines and Colors post which mentioned they might be difficult to find outside of Japan. I bought three (one for me and two for friends). Anxious to see the mechanism in action, I filled paper with test strokes in awe of it's consistent line (often with an audience). Once I got down to work, however, the awe turned to frustration: my touch was too delicate to advance the gears. 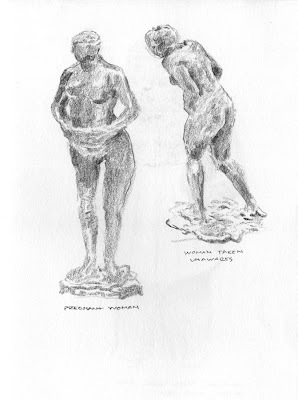 The reason I bring this up is because it relates to my basic conception of draftsmanship. The chances of my first stroke enduring through the drawing process to the final composition are next to none. Why not increase my odds of "hitting the mark" by increasing the area of the stroke? I can always go back and refine later, editing my previous paths down to the one I want. This isn't anything new. Art teachers have been telling their students (including me) to think broadly, then refine, for a long time. But it really comes down to math: a razor sharp line has only one shot at getting it right (especially if heavy-handed). A light, thick stroke lays down a haze of probability that not only has a greater chance of success, but provides the open-minded draftsman with potential inspiration. Sometimes a slow build-up of murky contrast can permit one's mind to see what isn't there, projecting form into former void. I still use the 0.5 mm Kuru Toga pencil, but it has become my writing tool of choice, providing a uniform trail for my more repetitious strokes. I concur fine sir, very well stated, succinct and accurate. I didn't realize you where a wordsmith too. This is a very important truism that every artist should learn and become functionally comfortable with the concept. While I like the idea of mech pencils, I don't really like them for drawing because of the fact that they can only make one kind of line. A friend of mine once commented that the only way to draw comics like Kirby is to never sharpen your pencil! It's so true if you look at his pencils, I'm sure he only sharpened his pencil when he absolutely needed to. I suppose that mech pencils are good for those artists that do the "ink with pencil" drawing style that some comics use these days that skip the inking stage. Interesting post, I've never heard of that pencil before. I know what you mean about being able to turn a pencil on its side and get a nice modulated line. 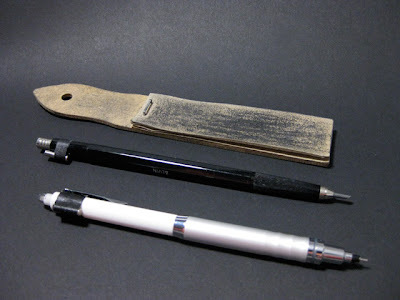 On the other hand, It could be cool to do some very nice detail work or quick wispy lines with the Kuru Toga pencil. Btw: I like your new header graphic! Dwight, I'm a wordsmith only when given the appropriate amount of time. But like I said, this isn't anything new, I just hoped to frame it in a way that my younger self could understand. Michael, I have to agree with you on Kirby — sometimes I imagine him drawing with a carpenter's pencil. As for me, my favorite drawing tool used to be a .9 mm mechanical pencil. I essentially used it the same way as my lead holder now, keeping the tip sharpened like a wedge. Shawn, the Kuru Toga is great for any kind of repetitive work, such as hatching. I can definitely draw with it, I just prefer something else for comics (which, for me, involves a lot of editing). Glad you like the new header.